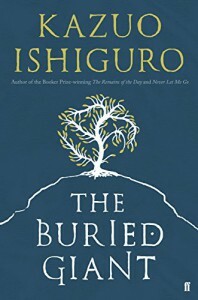 This latest book by Kazuo Ishiguro has the feel of another experimental departure. There is no doubt the author is a gifted writer and yet in this sojourn into the genre of fantasy and legend, his mastery of language underpins another compelling novel. It has not always been the case (I disliked 'The Unconsoled' quite strongly), but in this book there seems to be a return to the sure-footed exploration of relationships and character development that resonated so memorably through "The Remains of the Day" and "Never Let Me Go". In "The Buried Giant", set in post-Roman, post Authurian Britain, we follow the journey of elderly native couple, Axl and Beatrice, as they walk towards their son's village, some days away. Enter saxon warrior (Wiston) and later, aged nephew of King Arthur (Sir Gwawain), who befirend the couple on their travels, protect them through a series of diverting challenges and provide a welcome change of pace. Throughout the literal journey, Ishiguro also exposes gradually the challenges of a lifetime together, which have been overcome by the couple and the consequent strength of their relationship, weathered by such adversity. In that sense it is a very touching story of mature love and the complexity of of the human bond. No longer fueled by youthful passion perhaps, nonetheless, the poignant intimacy between Axl and Beatrice and their dogged loyalty to each other is inspiring and described with great empathy and skill. Arguably, a philosophical theme of the book surrounds the role of memory as the mortar, which binds together the foundations of our shared experience and upon which our one-to-one and broader collective relationships are constructed. Moreover, the partial interpretation of memories can prove both a blessing and a curse, which potentially subvert our respective futures. However, in a more prosaic reading, the inclusion of exciting swordplay, some wayward monks and a dragon, against a backdrop of ancient Britain and the plot woven by the author is simply an exceptionally crafted tale with a beauty in the writing, which will continue to live long in the memory.